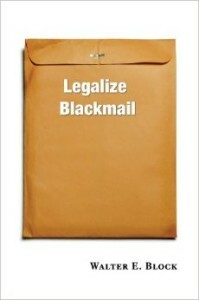 I was fortunate enough to get a PDF preview of Walter Block’s new book, Legalize Blackmail, before it was published, and today I was delighted to receive my hardcover copy in the mail. The book is a collection of Block’s essays on the subject of blackmail — specifically, why he believes it should be legal as a matter of libertarian principle — including rebuttals of many other scholars’ opinions. It’s the most thorough libertarian treatment of this subject that has ever been published or, I am confident, ever will be. And because it’s from Block, it’s a great read besides. Walter Block has made a career out of making himself and libertarianism look stupid. He eventually retracted and apologized for some of his first book length effort in The Voluntarist, http://voluntaryist.com/backissues/077.pdf but he is now apparently backsliding into the same old shock value for the sake of shock value syndrome. Sad, and sadder still that some libertarians applaud such absurdity. I guess that for some liberty has to be dressed up in a funny hat and crusader cape in order to be what they need. So do you think that laws against blackmail are actually compatible with libertarianism, that libertarians just shouldn’t think or talk about this issue, or what? I owe Walter somewhat for his assistance in my intellectual development. But like Rothbard, to whom Walter is the closest current author, he relies on the same ethics of the ghetto, and the entire elaborate structure of argumentative nonsense. Rothbard made us look stupid but he gave us hope. Promoting blackmail not only makes us look stupid, but it proves we are stupid, and it removes any hope of obtaining and holding liberty. Property rights are not given by god, by natural law, or by a logical inference from the necessary conditions for debate. The source of property rights is the organized use of violence to suppress free riding (“cheating”) in every arena of life, such that the only means of survival is mutually productive cooperation in the market for goods and services. Property rights are the CONSEQUENCE of the organized suppression of ‘cheating’ – they are not the CAUSE. Blackmail, like all the other rothbardian inverted logic, is not productive, and mutually beneficial even if it is consensual. It’s ‘cheating’. It’s free riding. IT’s not productive. And the only reason we should agree to abandon our use of violence, and cooperate, is for mutually beneficial ends. The entire rothbardian program was a disaster, and we can see that in the electoral data, in the literature. And in our impact on policy. Like Marx and Freud, and to some degree Cantor, Rothbard was yet another manufacturer of elaborate nonsensical arguments based upon false assumptions leading to catastrophic effects. Liberty originated ONLY with aristocratic egalitarianism. It did not originate in the ghetto. And it’s time to falsify Rothbardian obscurantist drivel, and return liberty to aristocracy: the organized application of violence to suppress all free riding and thereby deny opportunity for sustenance via every possible action EXCEPT the market. It’s time to ridicule and outcast parasitic rothbardian ethics from libertarian discourse. And if that means forcing people like Walter to continually recant their previous positions, or be labeled as proponents of one of the greatest intellectual scams in history, and by consequence an unethical, immoral, and socially detrimental man. If we cannot reform the Rothbardians and redirect them to abandoning the ethics of the ghetto, we must find the donors to these causes and publicly out them as conspirators against liberty. Because that is what they are. And I am ashamed that I was once one of them. The work of Walter Block–in and of itself–promotes only one thing in the end: intellectual development. His so-called retraction regarding the publication “Defending the Undefendable” was more a clarification than a back-pedal. The clarification of course related to his belief that readers might have construed he endorsed the behaviors he was defending. To legalize something is not (necessarily) to endorse or support it in libertarian thought. Carl Watner’s treatment of the concept in The Voluntaryist article is clear in this regard. Like Rothbard, Walter Block is, after all, a teacher.